Kate Campbell has been quite busy recently. The folk singer has opted to re-release material but with a different twist. 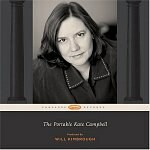 The Portable Kate Campbell is one of three that was released in early August, but this album in particular seems to stand out more than the others. Reworking songs that she originally released on Moonpie Dreams, Visions of Plenty, and Rosaryville, Campbell has some fine musicians helping her out in the form of Nanci Griffith, Kim Richey, and Rodney Crowell, among others. But it's Campbell who is front and center here. And she is certainly giving the listener plenty with 17 tracks that clock in at roughly 65 minutes. The album opens with "Wrought Iron Fences", which is a slow, traditional number with a bit of pop folk thrown in for good measure. Cosy and quite comforting, Campbell's voice is crystal clear and still a bit rough around the edges, like a haggard Mary Chapin Carpenter. Another benefit to the tune is the strong playing of producer Will Kimbrough on electric guitar. Campbell is generally in one niche on this album, especially on the tender, melancholic and soft "Moonpie Dreams" with just herself at a piano as a string quartet weaves in and out of the song. It has just enough orchestration to give it an extra bit of oomph. Far more simple yet inviting is the nestling "Visions of Plenty", which veers somewhere between Rosanne Cash and Emmylou Harris as it just glides along without much effort. Here she opens up more during the second verse, which rolls right off the first one seamlessly. The same can be said for the punchy, up-tempo tone to "Rosaryville" as the chorus kicks in at just the right time. The only setback is the conclusion that goes into overdrive and seems ill-planned. Nanci Griffith's harmonies on "Galaxie 500" are quite pretty as Campbell talks about the history of a car in relation to historical events such as the assassination of Martin Luther King, Jr. "Crazy In Alabama" is another gem, and, no, it isn't based around the Reese Witherspoon flick. Here Campbell takes a blueprint that Springsteen mastered during "My Hometown" from the Born in the USA album. While there is more name-dropping on this narrative about civil rights, the overall mood of the song is quite comparable to that Springsteen tune -- sparse but still doing everything needed to make it memorable. "A Perfect World" follows, and Campbell's duet with Rodney Crowell. Crowell could sing the latitude of European capitals and still make it sound great, and it's no different on this rather brief number. But unfortunately nothing can save the murky, percussion-driven "Porcelain Blue" that goes down a poor man's road of blues. Campbell goes outside of the usual folk norms for one of only a few times with the poppy "When Panthers Roamed in Arkansas", which instantly brings to mind Bonnie Raitt and any one of her recent albums. Horns add a lot to this rather funky tune and slide guitars are sprinkled throughout. But she goes in a totally different direction with the mountain-tinted "Deep Tang" that is bare-bones traditional. Her drawl is equally as impressive on this one as the previous one. The Latin hues add a lot to the story of "Rosa's Coronas", where Campbell she talks about a Cuban lady who has mastered the art of rolling cigars. Again she changes things up though with another piano pop tune that fares so-so. "See Rock City" sounds a bit too busy with the piano, guitars, and harmonies that add little to the tune. Wrapping things up is the tender and heartfelt "Look Away" that features Campbell with her voice and an acoustic guitar. As she has shown for most of her career, Campbell isn't big on special effects; she focuses instead on just good and solid songs. The craft is better for it, as this album proves.